For the Sales Head resume example, here is the profile of Ray Kroc, who is a 16+ yr. experienced sales professional. 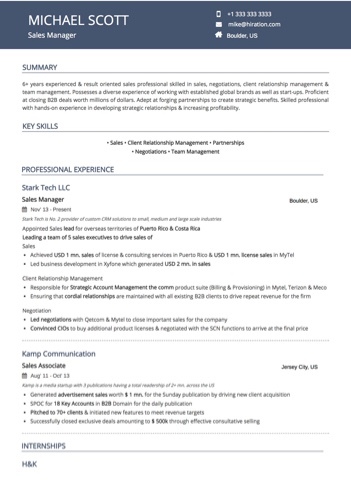 This Sales Head resume sample demonstrates multiple skill sets including partnerships, product sales, team management etc. 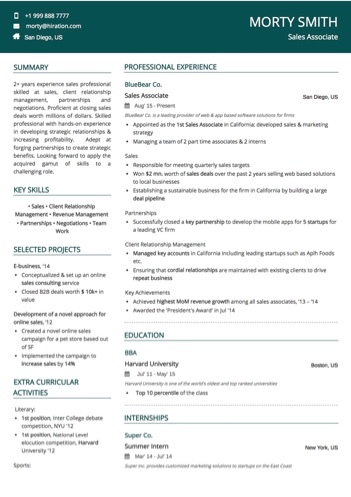 For the Sales Manager resume example, here is the profile of Michael Scott, who is a 6+ yr. experienced sales professional. This Sales Manager resume sample demonstrates multiple skill sets including sales, client relationship management, partnerships etc. For the Sales Associate resume example, here is the profile of Morty Smith, who is a 2+ yr. experienced sales professional. 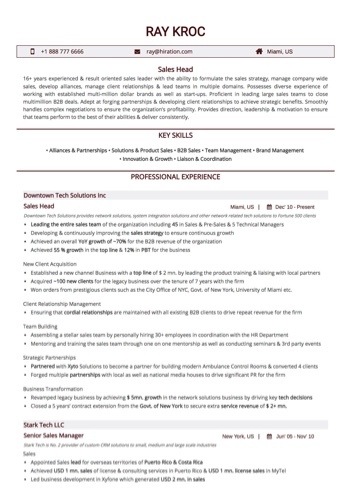 This Sales Associate resume sample demonstrates multiple skill sets including sales, client relationship management, negotiations etc. For the C-level Sales Executive resume example, here is the profile of Cheryl Blossom, who is 25+ years experienced business leader. This C-level Sales Exec resume sample demonstrates multiple skill sets including organizational leadership, business transformation, P&L management, alliances, etc. For the Regional Sales Manager resume example, here is the profile of Kate Mara, who is 10+ years experienced Zonal Sales Manager. 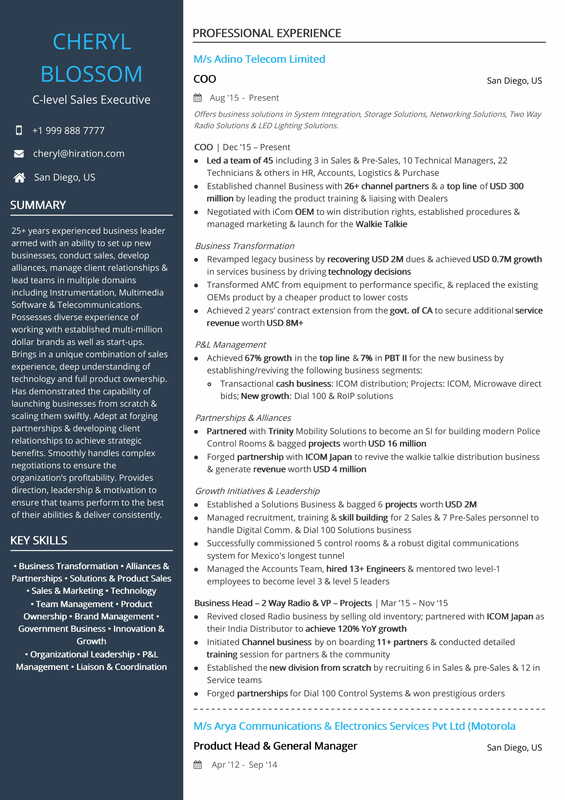 This Regional Sales Manager resume sample demonstrates multiple skill sets including partnerships, leadership, business development, project delivery, etc. "I'm Sales, you know. I don't need the perfect Sales resume. I can sell myself." Isn’t it ironic that you generated stellar sales in your last Sales profile, are confident that you’ll crack any interview, but a tiny snippet of a fact skipped your mind - that you actually have to reach the interview stage? If you’re looking for a new or better Sales job, there’s no point in registering record-breaking sales in your previous profile if you can’t sell yourself on a piece of paper. That’s what a perfect Sales resume is, isn’t it? You are selling yourself and if the recruiter likes the product, you are shortlisted. But if you start counting the number of companies you sent your Sales resume to, you might need a third hand (or fourth?). And how many of those bothered to call back? Is your hand curling into a raging fist because, surprise surprise, no one did? Is it because your resume did not have what it takes, or is it because the competition is just too high? How about you let go of the raging fist and take a step back. What can you do now? The key to unlocking that mystery lies in that one-page resume that you mindlessly send anywhere and everywhere. Our guide to writing the best Sales resume will tell you how to beat the competition and help you find the Wolf-of-Wall-Street-esque company you are looking for and deserve! How to describe your experience and frame points in your Sales resume? 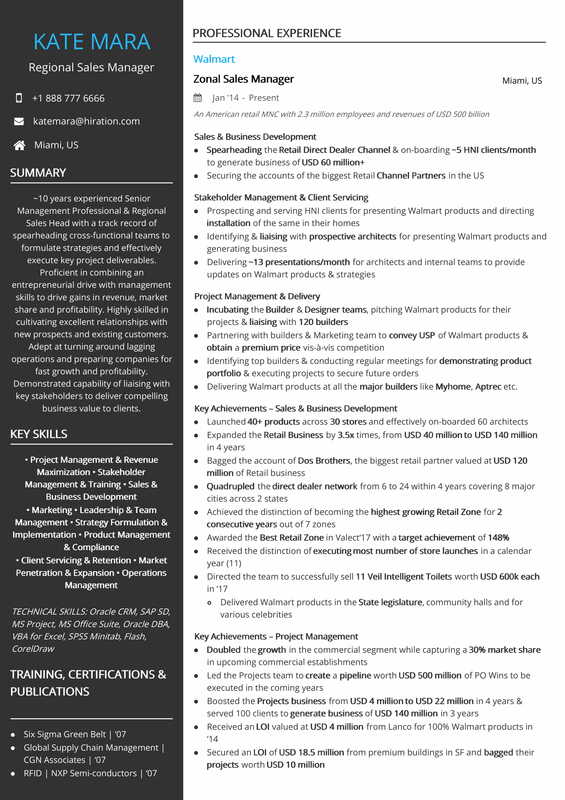 Here’s a sample Sales resume that was made using our online resume builder. Click here to download Sales resume samples and to go through some sample resumes of a Sales Professional. Before you go to sleep at night, do you calculate the number of companies that you sent your Sales resume to? Do you have nightmares of a cubicle full of HRs pouring over your resume and having a hearty laugh? Do you try to compute the ratio of how many callbacks you received? And does that ratio make you feel helpless? It’s not the ratio itself which is disheartening. It’s what you do after that. Are you the one to wallow in self-pity, or are you the one to take charge of the situation and do something about it? If you’re a Sales professional who has been in the field, you know the level of competition which is out there. You know it’s a dog-eat-dog world simply because of the very nature of the profession. And in such a scenario, the formula to survive is simple: eat or be eaten. Ever wonder what happens when weeks go by without you receiving even a single confirmation from the recruiter? Was your resume so bad that they did not see it worth their while to even spend a second on it? Before you blast off a list of back-alley insults to the recruiter, consider this: what if s/he didn’t even get a chance to look at your resume? Believe it or not, this happens more frequently than you think. Most companies use Applicant Tracking Systems (ATS) to filter out all job applications. You can’t really expect a bunch of poor HRs to pour over thousands of applications that they receive for a single Sales vacancy, right? How these 4 sections are played around on an actual Sales resume can range from professional to professional. Someone with 20+ years of work experience in Sales will structure his/her resume differently than, say, someone who has finished half a dozen different internships and is now ready to start out. A resume is either 1 page or 2 pages. Not 1.5 or 1.75 or 2.5. It’s a single document containing all your life achievements till date - every inch of space on that page is the prime real estate, and unnecessary white space in the bottom is as big a crime as a resume that exceeds 2 pages. So you saw an infographic resume somewhere online, and thought to yourself ‘What better way to present all your Sales achievements in all their glory than fancy graphs and charts? That ought to triumph everything else, right?’ Um, no. Granted, they do look fancy, but the job of a Sales resume is not to look fancy, it’s to get you that shortlist. Prima-facie, infographic resumes do deliver quite the impact, but the truth is, they make most ATSes go haywire. An ATS is programmed to parse only basic text. That means logos, tables, and graphs are out of the picture. A graph showing a meteoric rise in your sales will be useless if the ATS goes ‘huh?’ and trashes the same in the bin. As dumb as it sounds, don’t write ‘CV/Resume’ on the top. We’ve actually seen resumes with a ‘RESUME’ in bold for a heading, so let’s avoid that. Simply start off with your name, your current/targeted profile below it and your contact details. What about the file format? Most companies specify what they want (.docx, .pdf, hand-made paper from septuagenarian artisans in Japan, etc.) in the Job Description itself. In case of lack of information pertaining to the same, you can go for a .pdf with minimal formatting, as CNBC would suggest. Since you can never possibly know which ATS the company is using, or which way it has been programmed, you can play it safe by sending a .doc file to the ATS and a .pdf to the recruiters. That’s alright, but what about the font, font size or the margin? Go for sans-serif fonts like Calibri or Tahoma instead of serif fonts like Cambria or Times New Roman. If you pick a font, make sure it’s consistent throughout your resume. Having the heading in some fancy font and then the points in a standard font is a rookie mistake that we’ve seen countless times. Avoid a font size smaller than 10 or 11, and don’t underline words as they can distort the legibility of lower case letters like g, j or y. As far as margin is concerned, go for a minimum spacing of 0.5” on all 4 sides. We’ve actually seen people manually extend the margin to fit a point in one line, and that’s just blasphemy. It’s your entire professional life on a piece of paper, wouldn't’ you want it to look halfway decent at least? How many pages? Size matters, but not like the way you think. We’ve seen top-level executives and CXOs bragging about their 20-pages long resumes containing their entire life history, starting from their cashier job at Walmart 30 years ago. Don't. Do. That. 2 pages in the limit, trust us on that. Usually, for people with a Sales experience of 5-7 years or below, 1 page should suffice. For 10+ years, you can go for a 2-pager, but that’s it. Most HRs don’t think twice before throwing away a 5-pager resume in the bin. What is your argument? That if you literally mention everything, you’ll come across as being comprehensive and detail-oriented? Put yourself in the HR’s position and you’ll find out why that is not the case. Moreover, reducing your entire professional career to 2 pages is in itself a skill. And if an astute recruiter notices that, brownie points for you. Design: In a Sales resume, the design is secondary to content, let that sink in. Prioritizing design by compromising on content can land you in trouble. Just to clarify, no one is downplaying the role of a good design. It can automatically give you a boost over a majority of other Sales resume, even before the recruiter can dive down into the finer points. But that’s just it. A good design is just a gateway for the reader to enter the domain of content. But if the content isn’t engaging enough, no amount of flashy design can save you. And while we’re there, unless you’re applying for a Graphic Designer profile, you’d be better off toning down the flashiness a bit. There’s no point in spending hours fine-tuning the subtle nuances of design for your Sales resume if doing that very thing will render your resume un-parseable by the ATS. MS Word: Yeah yeah, we know. You’d rather make your resume on the bark of a tree than go for Word. Which is why there’s Option No. 2. Hiration’s Resume Builder: With 20+ premium designs and 100+ templates, you’ll find pre-filled sample resumes for almost every profession out there (and we’re adding more as you read this!). Never has the process of making and editing your resume been so much of a breeze. But don’t go by our word. Check out what others have to say as well, and then decide for yourself. When it comes to writing the perfect Sales resume, finding the correct way to add your contact details somehow doesn’t feature on top, right? But you do remember the dreadful ATS, don’t you? An ATS might as well come with a ‘My way or the highway’ bumper sticker, you might think. And that’s true. It’s true because if you fail to write your contact details and relevant information in the prescribed manner, the ATS is programmed to not even consider the rest of your resume. And you can’t blame it as well, right? In any professional environment, there’s an established process for everything. Why should resumes be any different? Most resumes in the US follow a fixed standard for contact details. Don’t write your complete address down to the flat number - it serves zero purposes at this stage of the recruitment process. Just the area and city code will do. Have a professional-looking email address. If your id is on a college domain name, it doesn’t matter if the college is Harvard, it just means that you still haven’t grown up. The country name comes only if you’re looking for a switch in location. If you’ve worked in the US your whole life and aren’t particularly looking for a change, don’t bother writing the US at the end of each work profile. That only makes sense if you have a track record of thriving in multiple continents and are open to recruiters globally. Skype/IMDb/LinkedIn: Are you sure your external profile will definitely give a boost-up to your Sales resume? Or are you having trouble remembering the last time you updated your LinkedIn? Linking your resume to a bland LinkedIn that still shows your work profile of 5 years ago as your current job, will not really help your case, will it? A Skype-id only makes sense if you’re applying for remote profiles, or if the company specifically asked for one. Remember, you only have one page to showcase your entire career to date. Every word counts, and we mean it. Are you a Sales Executive, a Sales Representative or a Sales Associate? Where are you right now, and where you do want to go? Don’t think of job titles as sacred keywords which can’t be played around with. If earlier you were an Executive but came across a Sales Representative profile that looks appealing, you can write Sales Representative right below your name. It’s surprising how little attention is paid to the Job title. Most resumes we encounter don’t even have them in the first place. The reader has to scan the CV for the current profile to actually find out what the applicant is doing, and that goes against our mantra of doing everything to make the recruiter’s job easier. In case you are looking for jobs similar to your current profile, the job title can remain unchanged, but we strongly advise you to have it on top. But in case you are looking for a switch or scale up, you have ample room to play around. What you essentially have to do is bridge the gap between where you are and where you want to go. It can be a bit tricky, and you’ve to be cautious to avoid misleading the recruiter. Your task is not to get shortlisted by the ATS. Your task is to prepare a stellar Sales resume which can form the basis of your interview with the recruiter, leading to your inevitable selection. The research will obviously help. Scan the Job Description for skills and requirements which you can align with your existing job profiles. You’ve to narrow down the search to that one catchphrase which will get you more hits than any other. Say it out loud before you proceed with your Sales resume - each and every word counts. More particularly the words which are right below your name. 4. 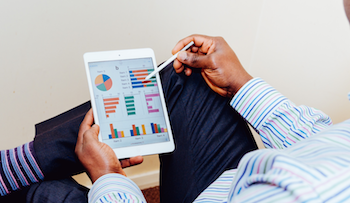 Should you go for a Summary section or an Objective section in your Sales Resume? Yo mama so old she still uses an Objective section in her resume. While we would strongly advise you to not use that in your next takedown, the truth remains. We’ve seen people devote hours to just optimizing their Objective section, without bothering to find out if it would even serve their purpose. Merely pointing out that you’re good in x, y and z is only half the job. You’ve to be explicit in pointing out how the skills that you possess will help the organization in achieving their goals - it’s the latter half which will get you shortlists. For this reason, it’s of paramount importance that you ditch the Objective section, go for a crisp Professional Summary section instead, and like Dylan said, don’t think twice, it’s alright. It’s common knowledge that any recruiter will devote not more than 6-10 seconds on your Sales resume at the first glance. And if at that moment, they see a drab Objective section where you have a shopping list of all the things that you are looking for, s/he won’t have any reason to continue reading. A concise Summary section, on the other hand, will not only mention your skills but also provide a proper context on how it would add value to the organization. Since the Summary section in your Sales resume will be the first thing that the recruiter will notice, let’s dive deeper and try to figure out how to actually go about framing points in this section. So you have a list of all the achievements across your entire career - how do you zero in on what all will make the cut on the top? That’s where the Job Description of your targeted Sales profile, your Bible for your job-hunt, comes in handy. Scan the JD for skills which the recruiter is looking for, and go back to your resume to find out what all existing achievements can be showcased along those lines. If on the first attempt, you can’t find anything, see what all points can be rephrased. Rephrasing is a double-edged sword though. The goal here is to customize your resume in such a way that it looks like it was made in response to the JD itself, that the person behind that piece of paper holds the solution to all the problems ailing the organization. But on the other hand, if you do manage to fool the ATS but the recruiter ends up feeling that you stuffed your resume with keywords from the JD...well that’s some irreversible Jurassic Park-level damage right there. When you break down your Sales resume, you can’t really change your achievements in your work profiles. The Summary section is what will take you from where you are to where you want to go. You can upload/paste the JD into this tool which examines the frequency of words used and gives you a jazzy word-cloud. It will give you an accurate idea of what all skills are highly prioritized by the recruiter. It’d also help to know what the Summary section of a Sales resume is not. It’s not a board for pinning all your achievements where you go about spouting numbers and clients. Reserve that for the relevant work profile. For that, you can reserve a separate Key Achievements bucket/sub-heading (more on that later) under each work profile. In the Summary section, avoid the specifics of your achievements and instead provide an overview of what you are capable of. ~7 years experienced, result-oriented and value-driven Senior Management Professional & Regional Sales Head with a track record of spearheading cross-functional teams to formulate strategies and effectively execute key project deliverables. Proficient in combining an entrepreneurial drive with management skills to drive major gains in revenue, market share and profitability. Highly skilled in cultivating excellent relationships with new prospects and existing customers. Adept at turning around lagging operations and preparing companies for fast growth and profitability. Demonstrated capability of liaising with key stakeholders to deliver compelling business value to clients. 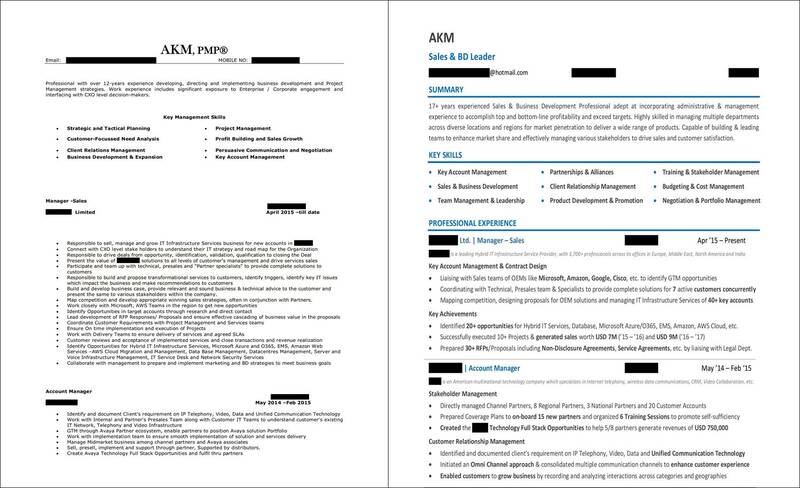 What are some broad-level key skills in a Sales resume? The Key Skills section of a Sales resume is where you have the chance to dump all your research around keywords and job description. But a word of caution. Don’t go overboard! For an experienced recruiter, it won’t take a minute to find out if the key skills are actually genuine or whether they’ve been dumped for the sake of it. Like we mentioned, the journey of your Sales resume does not end at ATS. If keyword-stuffing was the solution to all ATS problems, everyone would be doing it. You can fool the machine (even though most modern ATSs are equipped to deal with cases of keyword stuffing, and some even penalize the applicant by blocking them from all subsequent vacancies) but the recruiter sitting behind the ATS has been handling resumes for years. Good luck fooling them. Add only those skills which have been substantiated in your work profiles below. Any discrepancy in this regard can backfire, you can bet your bottom dollar on that. And sidenote. MS Office as a skill doesn’t count. I mean, c’mon. Another thing we’ve seen people bungle up on their Sales resume is to have an unhealthy mix of soft skills and hard, professional skills. What we forget is that the ATS, the machine we hate because we don’t understand it, is, at the end of the day, operated by humans alone. Adding soft skills like ‘creative’ and ‘team-player’...just how exactly do you see it working out in your favour? You don’t expect a recruiter to filter out applicants based on those skills, right? The ideal way is to have a healthy mix of both, with priority given to professional skills which you’ve gained in the course of your tenure. It’s your job to anticipate what all keywords the recruiter might use to filter out the thousands of applicants, and it’s your job to optimize your resume according to that. Additionally, having a ready list of your core competencies in your Sales resume will allow you to easily remove and add relevant keywords based on the profile you’re applying. 6. How to describe your experience in Sales and frame points in your resume? It might help to research and find out the norms which are followed in your industry or location - whether companies ask for functional resumes or reverse chronological ones. Additional factors are also considered; for instance, whether you were a Sales Consultant or in public service, if there are gaps in your career, if you were working on an ad-hoc or contract basis, etc. A common ATS blunder which most people make is to mention the date of joining or location before the employer’s name. The order to be followed is employer’s name > job title > date > location. When you only have one line to sensibly link all these 4 parameters, it will definitely not be easy in the first go, but trust us, the result is worth it. The keywords from your research on JD and beyond will be incorporated here as well, in addition to the Summary and Key Skills section. Most people invariably fall on two extreme ends of the spectrum - either their resume will be entirely responsibilities-based or they’ll only list out their achievements. Either of the two only paints an incomplete picture. But the Princeton formula flawlessly ties up your job role, what you did, how you did it, and its quantifiable impact. Buckets/Subheadings: Let’s say you smoothly applied the Princeton formula for your current work profile and are now left with 8-10 odd points. Now, a vast majority of the people will stop here itself and will continue with the rest. But not you. You need to jump from the poor jetty with 99% of applicants sailing in it to the luxury liner with the top 1% on-board. How do you that? Start off with having another look at those ~10 points and grouping similar points together. Let’s say some points are around Sales & Business Development, a few points focus on you forging strategic alliances & partnerships for boosting the business, others talk about the various stakRecommend that you shift to a design that has more color and a better font style/size combination. An overall design improvement will really help. More colour certainly does not mean colourful - it just means applying basic principles of design to integrate colour and text.eholders that you were coordinating with, etc. ou can go a step ahead and try to link the sub-headings that you use with the keywords research and Key Skills that go on top. That adds a tremendous and unparalleled amount of coherence to your Sales resume. Here’s an example of buckets in action. Below you’ll see perfectly framed points more or less along the lines of the Princeton formula. You’ll notice how the journey of framing points does not end here. Here’s why. What’s the first impression? Do you just see a wall of text and nothing else? Do you feel like you need to take a few deep breaths before you begin reading? Surprise surprise, the recruiters going through your resume also feels the same. And how can you blame them? You did not follow our mantra of making their job easier, did you? If this isn’t *mic drop* stuff, we don’t know what is. The points remained the same, but simply assigning buckets exponentially enhanced the readability of these points. That’s what you should ideally be targeting. Cause-effect: We talked about incorporating 4 parameters in each point. How you place them in a sentence is the cause-effect relationship. The power verb shouldn’t be random but something that goes with the other three factors. The accomplishment, in the end, should feel like it organically flowed from the project/assignment you did. If you can manage that for your entire resume for all the points, believe us, you’ve mastered what 90% of job applicants are simply not aware of. Another option is to have a separate ‘acquired skills’ section within each work ex, like another bucket of sorts. The opportunity cost of this would be the space that could have been utilized to highlight your accomplishments. You can take a call on that. Just keep in mind that blindly fulfilling the keywords criteria is not a solution either. Overall coherence is a must as well. The education section for a Sales resume can be pretty basic, right? Remember ATS? It’s always there, waiting for you to commit a mistake so it can trash your resume. You can see which one delivers more impact. We mentioned, in the beginning, the break-up of a resume into 4 broad sections. In addition to the Education section, you can have additional sections on Training, Certifications, Additional Achievements, etc. Try not to club your certifications with your education - it’s better if the Education section exclusively contains your academic details so that everything else can be grouped into different sections. What about hobbies or interests? Again, let’s go back to our previous mantra. Place yourself in the recruiter’s shoes. A bit of research can help as well. Check out the website of the company which you are targeting. Usually, organizations participate in various competitions and nurture dedicated teams for the same. Hypothetically, if you see on the website that a company has been participating in tennis competitions and has been playing against other organizations for years, lo! As luck would have it, you’re a budding tennis player as well. In that case, go ahead and mention the same in glowing letters. But let’s face it, this probably won’t be possible in every case. What do you do then? Bottomline: simply adding the Hobbies/Interests section while making it look like you’re just adding it to fill empty space won’t serve any purpose. If you really want to demonstrate your interests in addition to your professional achievements, go on and show how they’re important for you. Just adding ‘photography’ under a Hobbies section is worthless. Add a line to further showcase just how exactly you are passionate about it. It always helps if the recruiter/organization knows that you’ve other healthy interests. For your training and certifications, make sure you add the year and certifying authority as well. Other sections can range from Publications (especially in academic profiles), Memberships (of pan-country organizations and non-profits), Conferences, etc. We’ve seen a norm where people reserve a separate section of Key Achievements consisting of ALL the achievements across ALL the profiles in their career till date. The downside of that approach is that each achievement of yours ends up becoming just a point in the list. An alternative approach can be to place the achievements only under the relevant work profile. Consequently, the reader gains an understanding of the context in which the achievement was garnered as well, thus enabling an enhanced appreciation of the same. You can have a separate bucket/sub-heading of Key Achievements for each work profile. Till now, we’ve given you a vague idea of a mystical entity called ATS which you should be wary of. But the ATS is much more than that. Once you have figured out how it works, you can use it to your advantage and gain an edge over thousands of other aspirants all vying for the same role that you are. It’s always better to write your resume while keeping both the machine (ATS) and the person (HR) in mind. Don’t forget - an ATS is only as functional and as effective as the HR behind it. So how does an ATS really work? The software begins by removing all formatting from the resume. That’s right. All your designs and graphics and flowcharts are first stripped down and then the ATS begins to break down your resume - hence the reason why we mentioned that design is secondary to content on a resume. Subsequently, it will scan for specific keywords and phrases. Where do these keywords come from? Yep, you guessed it right. Like we earlier stated, almost all the words in a JD can be construed as keywords which can be used by an HR to screen and shortlist candidates. The ATS will break down your resume into individual categories: Education, Contact Information, Skills and Work Experience. The desired skills and keywords are then matched against your resume to determine your potential value to the organization. Resumes with the highest scores relevant to the specified keywords/phrases will be moved up for further review. Now you know how it broadly works. But how to trick the ATS into ranking you higher than everybody else? The answer to that can range from tiny pointers to a comprehensive breakdown of your resume in accordance with ATS requirements. Do away with the headers. Make sure even the contact information is not in the header/footer. Use acronyms and spell out the full-form of titles, professional organizations, certifications, and other jargon. If you are proficient in search engine optimization, for instance, include the acronym SEO as well. You don’t know which keyword the ATS has been programmed to scan for. Using both allows you to cover all your bases. We’ve seen an ATS processing ‘MBA’, ‘Master in Business Administration’, ‘Masters in Business Administration’, ‘Master’s of Business Administration’ differently. Which is why we earlier stated that the JD is the Bible for your resume. Swear by it. You can repeat important keywords which are relevant to your profile multiple times while avoiding keyword stuffing just for the sake of it. Remember, your task is not to get past the ATS, it’s to get that high-profile job. Even if you’re shortlisted, it won’t matter if the HR sees your resume stuffed with keywords without a thought for coherence or comprehension. Use bullets rather than paragraphs to describe your work. Try to make sure that a point does not exceed a line - in case it does, you can split it into multiple points or sub-points. The idea behind the same is simple: when you’re forced to write your accomplishments in a single line, you automatically weed out all the fluff. There’s no other way to ensure the same than to maintain the cause-effect relation in every point as per the ARPA formula we highlighted earlier. Take advantage of cloud services like Wordle and TagCrowd. Once you upload any JD on these portals, it analyzes the frequency of each word and gives you the results. This analysis will be useful when you are trying to figure out which keywords to use, where, and how many times. Avoid or minimize usage of creative words and descriptions. Adding a 3-line point saying how you are a team-player who prioritizes organizational goals serves little purpose to the HR. Instead, use the company’s website for help on keyword guidance. If a firm has a track record of being environment-conscious, you’ll be better off to include the volunteer work you’ve done for the environment or organizational memberships you have that are in similar domains. Include your address. Locations may even be included as keywords in the screening process. Avoid using graphics, logos or tables. Avoid special characters (bullets are okay though) and serif fonts like Times New Roman or Cambria. Instead, go for sans-serif fonts like Calibri or Tahoma while keeping a minimum font size of 10. Whether you want to completely revamp your existing cv or whether it’s been ages since you last updated it, a master CV is ideally the way to go. It solves multiple purposes: you’ll have a single document with EVERYTHING you’ve ever done. You aren’t supposed to filter the content at this stage. Just write down everything you’ve ever done, in whatever language you see fit. Make sure you’re periodically updating the document as well. As per most of our client interactions, it’s quite easy to simply forget what all you did in a particular profile. Months and years pass and when you’re suddenly in need of an updated resume, you draw a blank as to what is it that you actually did. If you have a master CV with a comprehensive list of all your achievements, you can then take out points and tailor your resume as per the requirements of the job you’re targeting. Think about your experiences (past and present) including education, coursework, jobs, internships, activities, honors, publications, language skills, overseas academic experiences and community service projects. This is not the time for editing points or looking after the language. No one’s going to see your master CV but you. It also solves the most common problem that procrastinators deploy – that you won’t proceed unless you have the perfect point on paper. You’re not looking for perfection at this stage. It’s just a giant info dump of all your experiences – your job is to keep it updated and pull out points from here for tailoring/rephrasing it as per the job requirements you are targeting. And the last step is important. Recruiters can figure out if you spent some time on your resume or even looked at the JD, or whether you simply selected a dozen listings from a job portal app and hit ‘send resume’. The latter’s not attractive at all. The former is what gets you shortlists. This single document will stay with you forever and can exceed 2 or 5 or 10 pages. It won’t matter. It ensures you have a single place that lists all your achievements. From here-on, it’s simply targeting what jobs you need and picking out points from this document to boost your chances of getting shortlisted. And if that’s not enough, your master CV is going to help a lot in your interviews. Interviews are mostly resume-based, and to avoid being sloppy when it comes to answering those questions, your master CV will have points with proper context. It might sound implausible, but there have been thousands of instances where people blank out while answering questions from points straight out of their resume. That raises multiple doubts, from your ability as an effective communicator, to even writing the document on your own in the first place. Research is something that’d go a long way in ensuring that. Go through multiple JDs of your profiles to shortlist terms/phrases that are to be expected. A rule of thumb is that pretty much everything that’s mentioned in the JD is a keyword. It’s your job to filter out terms that can go on your resume without looking like you simply plagiarised it. A few other common pointers include not using first-person pronouns, going easy with the articles (a/ an/the - losing an article now and then will make it crisper), not using full-stops in the end (since resume points are not complete English sentences), excluding personal details (though its extent can vary; recruiters in the US are forbidden from asking any personal information whatsoever – age, gender, religion, marital status, etc, while others elsewhere ask for passport details as well). And lastly, proofread. A dozen times. And then some more. Grammatical errors are an instant turn off for most recruiters. If you can’t make a one-page document, about yourself, error-free, how can one expect effective delivery of organizational goals from you? Send out your resume to friends, family and other professionals in your network for a peer review. It’s possible that being too close to your resume means you won’t be the most reliable judge of its quality. Let the people in your network assume that role. To revisit the most critical points of building a professional Sales resume that really gets you what you want, create a resume template that you can customize for each new vacancy. Once you build a master list of all your skills, experience, and achievements, it'll be easy. See this guide for tips. Sell the benefits. Start with details in the job description, then plug in wins from your career so far. Got some questions or tips on how to make a great Sales resume? Give us a shout in the comments section!